Der Besuch der Veranstaltung entspricht 3 ECTS Punkten. Mit Vortrag und Ausarbeitung ergeben sich 5 ECTS Punkte. 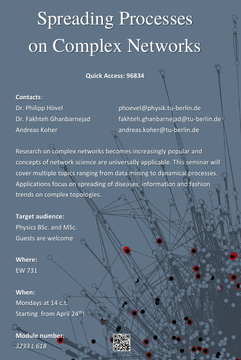 The seminar offers perspectives on our current research in the area of Nonlinear Dynamics and Control. The seminar is particularly suitable for BSc and MSc students looking for a final project. Students, who want to obtain a Seminarschein, are welcome as well. Research on complex networks becomes increasingly popular and concepts of network science are universally applicable. 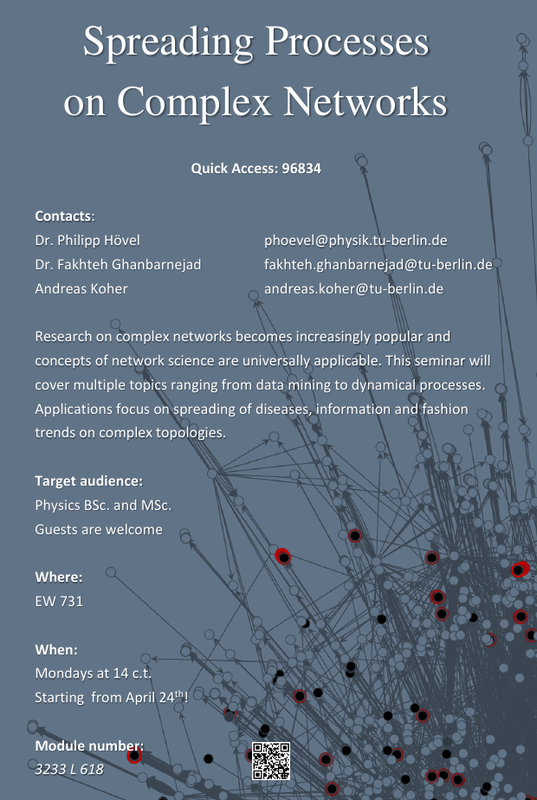 This seminar will cover multiple topics ranging from data mining to dynamical processes. Applications focus on spreading of diseases, information and fashion trends on complex topologies. The poster announcement can be downloaded here: poster_ss17.pdf. Vorträge, die mit einem * markiert sind, können von Studenten zur Erlangung eines Seminarscheins gehalten werden. Wer Interesse an einem Vortrag hat, sollte sich mit den entsprechenden Betreuern in Verbindung setzen. Die Vortragsthemen werden dann spätestens in der ersten Seminarstunde am 24. April 2017 verteilt. [BAC14a] Backlund, V.-P., Saramäki, J., and Pan, R. K. , Effects of temporal correlations on cascades: Threshold models on temporal networks, Phys. Rev. A 89, 6, 062815 (2014). [BRE16] Brechtel, A., Gramlich, P., Ritterskamp, D., Drossel, B. and Gross, T., Master stability functions reveal diffusion-driven instabilities in multi-layer networks, arXiv preprint arXiv:1610.07635 (2016). [BRO13] Brockmann, D. and Helbing, D,, The hidden geometry of complex, network-driven contagion phenomena, Science 342, 6164, 1337 (2013). [CAI15] Cai, W., Chen, L., Ghanbarnejad, F., and Grassberger, P. , Avalanche outbreaks emerging in cooperative contagions, Nature Physics 11, 11, 936 (2015). [CHE13a] Chen, L., Ghanbarnejad, F., Cai, W., and Grassberger, P. , Outbreaks of coinfections: The critical role of cooperativity, EPL 104, 5, 50001 (2013). [IAN17] Iannelli, F., Koher, A., Brockmann, D. , Hövel, P. and Sokolov, I. M. , Effective distances for epidemics spreading on complex networks, Phys. Rev. E 95, 012313 (2017). [KON13] Konschake, M. , Lentz, H. H. K., Conraths, F., Hövel, P. and Selhorst, T., On the Robustness of In- and Out-Components in a Temporal Network, PLoS ONE 8, 2, e55223 (2013). [LEN13] Lentz, H. H. K., Selhorst, T. and Sokolov, I., Unfolding Accessibility Provides a Macroscopic Approach to Temporal Networks, Phys. Rev. Lett. 110, 118701 (2013). [LEN16] Lentz, H. H. K., Koher, A., Hövel, P., Gethmann, J., Sauter-Louis, C., Selhorst, T. and Conraths, F., Disease spread through animal movements: a static and temporal network analysis of pig trade in Germany, PLoS ONE 11, 5, e0155196 (2016). [LIU14] Liu, S., Perra, N., Karsai, M. and Vespignani, A. , Controlling contagion processes in activity driven networks, Phys. Rev. Lett. 112, 11, 118702 (2014). [PER12b] Perra, N., Goncalves, B., Pastor-Satorras, R. and Vespignani, A. , Activity driven modeling of time varying networks, Sci. Rep. 2, 469 (2012). [SIN13c] Singh, P, Sreenivasan, S, Szymanski, B. K. and Korniss, G. , Threshold-limited spreading in social networks with multiple initiators, Sci. Rep. 3, 2330 (2013).